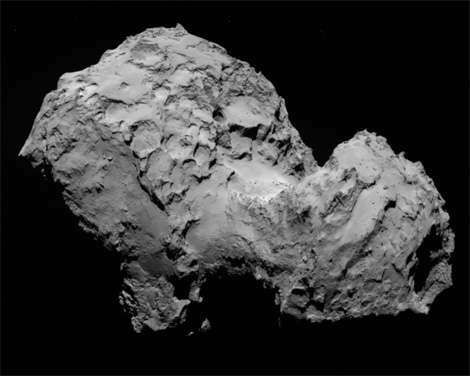 The Rosetta space probe discovered a large amount of organic material in the nucleus of comet 'Chury.' In an article published by MNRAS on Aug. 31, 2017, two French researchers advance the theory that this matter has its origin in interstellar space and predates the birth of the solar system. The ESA's Rosetta mission, which ended in September 2016, found that organic matter made up 40% (by mass) of the nucleus of comet 67P Churyumov-Gerasimenko, a.k.a. Chury. Organic compounds, combining carbon, hydrogen, nitrogen, and oxygen, are building blocks of life on Earth. Yet, according to Jean-Loup Bertaux and Rosine Lallement—from the Laboratoire Atmosphères, Milieux, Observations Spatiales (CNRS / UPMC / Université de Versailles Saint-Quentin-en-Yvelines) and the Galaxies, Étoiles, Physique et Instrumentation department of the Paris Observatory (Observatoire de Paris / CNRS / Université Paris Diderot), respectively—these organic molecules were produced in interstellar space, well before the formation of the Solar System. Bertaux and Lallement further assert that astronomers are already familiar with much of this matter.